What is Corporate Travel Insurance? When business travel doesn’t go to plan, Corporate Travel Insurance can help to cover out-of-pocket costs to your business and employees. If you or your employees need to travel for work, Corporate Travel Insurance can protect your business from financial loss associated with situations such as overseas health emergencies, flight cancellations or lost and stolen baggage. Corporate Travel Insurance is similar to personal travel insurance. It can cover your business for unanticipated travel costs if specific events happen. Corporate Travel Insurance also covers your directors and employees and spouses and dependants travelling with them. Corporate Travel Insurance policies vary in the benefits they provide. Your Westlawn Insurance Broker can help you find the right product to suit your business travel needs. There are other exclusions which your Westlawn Insurance Broker can outline for you. While visiting clients in London, your employee falls down a flight of stairs, fracturing their hip and breaking their arm. After being taken to hospital in an ambulance, doctors take x-rays and MRIs of the injured areas. Your employee is informed that they require surgery on their hip and will have to undergo physiotherapy before they will be allowed to fly home to Australia. Their flight is scheduled for the following day but will now need to be cancelled. 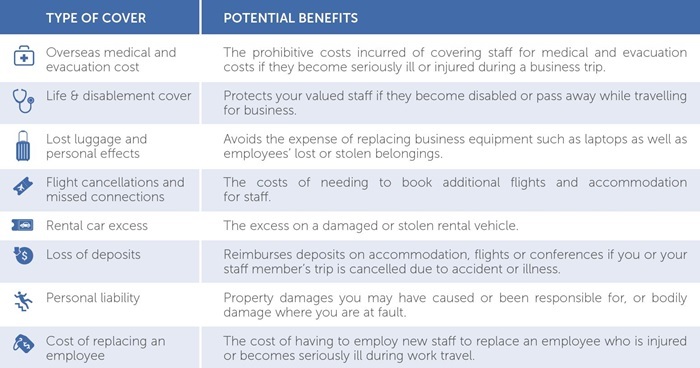 A Corporate Travel Insurance policy allows you to recover some or all of these costs. Depending on the policy, you may be able to claim for the medical costs of their surgery and rehabilitation ,as well as the flight cancellation and additional accommodation required while your employee undergoes physiotherapy. You may also be able to claim for the hire of someone to to take over your employee’s duties until they are back in Australia and fit to return to work.